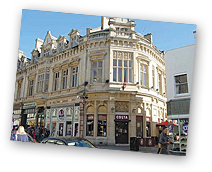 The town of Cheltenham originally became famous because of its waters – hence the name The Cheltenham Spa. According to records, people used to believe that the waters from Cheltenham had unique healing properties. This reputation has caused numerous flocks of individuals came to stay at the town, resulting in the establishment of numerous spas and entertainment centers in the town. The Pittville Pump Room is the biggest Grade I listed building at the present was one of the biggest and most well-known spa buildings, built between 1825 and 1830 by then architect John Forbes. The land was owned by Joseph Pitt who gave the area the name by which we know it today - Pittville Park. The Pittville Pump room became the center piece of a pleasure garden with the rise of the town’s fame. Inside the Pump Room is a slew of amenities – a ballroom on the ground floor, a gallery supported by multiple columns under the dome where music is usually played, a billiard room, a library, a reading room, and statues of Hygieia, Aesculapius and Hippocrates by Lucius Gahagen. Unfortunately, the Pittville Pump Room eventually went bankrupt. Presently, the Pittville Pump Room is home to the Cheltenham Music Festival and is used as a concert hall. Standing in the splendor situated around 2 miles from the Cheltenham Square, The Pittville Pump Rooms is the perfect venue for a romantic wedding – set in a public parkland that’s overflowing with charm and is definitely ‘Instagram worthy’. The Pittville Pump Room is a must visit for any tourist passing through or visiting Cheltenham during the warm summer months as not only is it a perfect destination for people who are interested in history, it’s also the destination of any music lover in town for the annual Cheltenham Music Festival. The Pittville Pump Room is within the vicinity of the Promenade Apartments – a perfect lodging location for sightseeing, as well as accommodations during the numerous festivals and races throughout the year. Make sure to book your rooms in advance before they run out! Call us today!